Itâ€™s completely oil/butter based which is great for dry skin. I have a huge problem with getting it out of the tube because itâ€™s too thick. I have to push really hard for a small amount to come out. Thatâ€™s probably the biggest set back. Itâ€™s unscented and doesnâ€™t have that great of a natural smell, but I am ok with that as it dissipates quickly. Great product! Perfect for sensitive skin. My favorite natural sunscreen on the market. I have very dry skin so I really like this sunscreen (itâ€™s oily). I actually tried another sunscreen with better reviews but will be returning to this one! This one does leave a bit of a white cast at first but I find thatâ€™s just if I use too much - it goes away once I work it into tha skin. Itâ€™s moisturizing and light on the skin and I donâ€™t get that heavy feeling I sometimes get when wearing other sunscreens. Thank you well.ca for carrying this product! I was looking for a cheaper alternative to Tarteguard but this isn't it. This product is a greasy, waxy, chunky, watery mess. 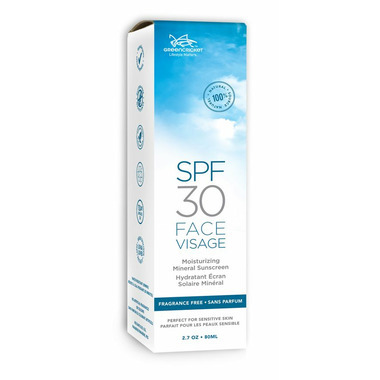 I was given a tube of this facial sunscreen for my trip to Africa and have been very thankful for both the sun protection and the moisturizing for my face in this hot, dry climate! i will certainly buy it and continue to use it at home in Ontario! And I am delighted that it is environmentally friendly! Hurray for Green Cricket for developing a new product! By the way I am also using Green Cricket's lip sunscreen and like it as well! I received a free small sample of this and used it a lot on my summer holiday. I found that the product as delivered is a bit chunkier in consistency (less creamy and smooth). As another commenter noted below, it's a bit hard to squeeze out of the tube (the small pot worked way better than the tube). As far as a good, eco-friendly sunscreen goes this is probably the easiest to apply. It's a bit oily but not too much so; I'll keep using it. I tries this product for the first time and used it a couple of times. I found the product to be too oily. I find this product leave my skin feeling oily but does moisturize. It's hard to find an all natural face cream that works as sunscreen too. Just bought this and used it twice. Great for sensitive skin! I really like the natural ingredients in this product, but it is difficult to get out of tube without removing cover. Love this. I have really sensitive, pale skin and I didn't break out or get sunburnt on vacation at all. Now I wear it under my makeup when I know I'm going to be out in the sun during the day - it goes on smooth and isn't greasy. Because I liked the sample, I bought the normal size bottle and I like it. But there is a problem = the cream does not push through the opening of the cover. So I must unscrew the cover, push it out and I really must use the force to get the cream out. So that I do not like. Therefore I give only 3 stars, even though the cream is nice. And I am not sure that I will buy it again. It is too expensive and not easy to use. I tried this moisturizer as a sample and now ordering a full bottle, light weight, non-greasy, natural, and great sun protection. Received a sample of this from my last Well.ca order. Really liked it... applied very smoothly. Definitely had a white cast, but give it some time to sink in! Will be purchasing full size to test under makeup, but this is the rating for the sample.